Agency 215, Legacy Effects (props), and Method Studios (visual effects). 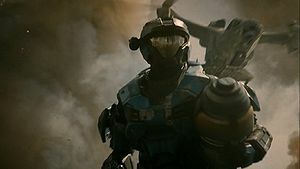 Deliver Hope is a live-action trailer for Halo: Reach, part of the Remember Reach marketing campaign. It was released on August 26, 2010 and has a runtime of 1:06. The trailer takes place before the events of the actual game, during the battle on the colony of Fumirole, where Noble Team destroys a CCS-class Battlecruiser using a Medium Fusion Destructive Device. The video opens with Kat-B320 running across a battlefield in a ruined human city, holding an MFDD while firing an M6G sidearm with her other hand. Covenant ground forces, including Sangheili Ultras and Unggoy, can be seen assaulting human troops. The view cuts to show Jorge-052, supporting regular human infantry with his heavy machine gun and faces forward where you can see Emile-A239 waving Kat through to the left. The camera briefly cuts to show a wider view of the battle, revealing a Covenant CCS-class Battlecruiser hovering above the city, while two UH-144 Falcons fly past the camera, their turrets firing at targets on the ground. The camera then cuts to Kat's first-person view, with her arming the MFDD. A five-minute countdown appears on her heads-up display. She keeps running through the battlefield, and in the background, Carter-A259 can be seen assassinating an Elite. Several shots of Kat running are shown, one from first-person view of her firing her pistol (killing a Skirmisher) and another showing the reflection of the Covenant cruiser on her faceplate. A first-person view of Jun-A266 seeing Kat under fire is shown, in which he raises his sniper rifle's scope and then snipes an Ultra. After Kat leaps over an obstacle, a Banshee swoops overhead, and fires a plasma bolt from its Fuel Rod Cannon. The bolt impacts the ground right next to Kat, and the explosion sends her flying through the air, leaving her and the nuke lying on the ground. The nuke is shown to have two minutes left in its countdown display. Thom-293 arrives at the spot where Kat is lying, briefly looks at her, and then picks up the nuke. Kat's eyes are shown reflected in her cracked visor as she watches Thom activate his jetpack, take off and fly toward the Covenant cruiser, entering the ship through its gravity lift. Inside, he rushes to a ledge overlooking a hangar bay where multiple Phantoms and Banshees are docked, and countless Unggoy move on the lower floor. Thom tosses the MFDD down and starts running back the way he entered the room. As the nuke flies to the camera, its display shows 00:01 left in the countdown. During production, the early storyboards showed Kat's arm being severed, presumably by the fuel rod cannon blast that knocks her down. However, the scene was deemed too violent for television and was subsequently cut. Instead smoke is emitted from Kat's right shoulder, indicating a possible issue with her arm, and hinting that it needed to be amputated. Bungie's Associate Producer Dave Lieber produced a sound dialogue (provided on the right) of an Elite commander giving out a rousing speech for his combatants after being asked to explore what Elites might sound like just before a big battle. This sound dialogue was absent in the final production. The fact that Kat does not have a prosthetic arm implies that the events seen in the trailer take place before the Fall of Reach. This was later confirmed by Bungie. However, the trailer is intentionally vague about the setting, which may lead casual fans to assume that it takes place on Reach. It was later confirmed by the Halo: Essential Guide, that the events shown transpire during the Battle of Fumirole. Two Elite Ultras are seen wielding both energy swords and plasma rifles, a combination that has never been seen before. Such a combination would greatly mitigate the drawbacks of using a sword, which is most likely why it is not seen in any of the games. When Kat drops the device, the screen shows that 63 terajoules of energy are released upon detonation. The atomic bomb that exploded over Hiroshima during World War II released 60 terajoules of energy. Jorge-052 is seen wielding his M247H left handed, although he wields it right handedly in Halo: Reach. It is unknown whether he uses the weapon ambidextrously, or if this is merely an oversight. The shielding on the CCS-class battlecruiser appears similar to the energy shielding on the Sentinels in Halo 3, as well as that of the Bubble Shield and the Drop Shield, as all four display hexagonal shapes. Kat does not wear a jetpack, leaving it suspicious about how she intended to reach the cruiser's gravity lift, lending further credence to Holland's statement that Thom's death was the result of acting impulsively. The Army soldiers are shown using the MA5C instead of the MA37 ICWS, which is standard-issue for Army units. It is possible that Army units on different planets are equipped differently. 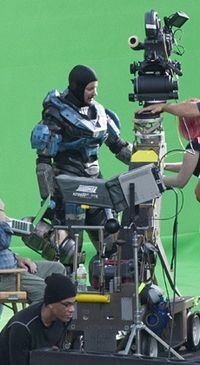 From a production standpoint, the MA5C props were used as they were readily available, having previously been used in The Life, the extended version of Birth of a Spartan, and Patrol. Kat is actually played by a male stunt man in the scenes where she is running, but is played by a woman in the scene with the point of view inside her helmet. The Elite Ultra being assassinated by Carter is also played by a man in an Elite suit. Kat's armor suit used within the trailer was later re-used during PAX 2010, where Kat was instead depicted by hired cosplayer Jordan Konkel. It and Thom's Mark V[B] were later repainted and used for Kelly-087 and Fred-104 in Halo 4: Forward Unto Dawn. The matte painting used as the backdrop for the commercial. Concept art of the aerial battle on Fumirole. Concept art of UNSC infantry engaging Covenant forces on Fumirole. Kat's Mjolnir armor created for the ad. The CCS cruiser's interior hangar. Thom-293 using a jetpack to enter the Covenant Battlecruiser. Thom gazes into the cruiser's hangar bay just before he deploys the MFDD. Kat's eyes reflected on her cracked visor. Kat's view of Thom from inside her helmet. Falcons arrive to provide fire support for the advancing UNSC ground forces. The CCS Battlecruiser being destroyed. The MFDD's explosion as seen from orbit.